Carolyn Julien is the wife of a pastor who works with Samaritan’s Purse in Haiti. “A man’s heart plans his way, but the Lord directs his steps” (Proverbs 16:9, NKJV). When Jiesha Perkins met Mel Brister several years ago, she had no idea it was possibly a divine meeting ordained by God to bless the Haitian people and would serve as an answer to prayers later. I believe God moves in mysterious ways to order the steps of His people to answer our prayers through divine appointments. Jiesha (left), Dr. Mel (center), and Carolyn (right) worked together with others pictured to help people in Haiti with their eye needs. While residing in Ohio, Jiesha and Mel were brought together to plan a missionary trip. Through the years, they maintained contact with one another and, ultimately, an opportunity found them collaborating once again. Jiesha noticed Faublas Andre-Jacque, one of her staff members at Samaritan’s Purse in Haiti, squinted his eyes whenever he worked at his computer. She asked about his discomfort, and he informed her that he had vision problems but couldn’t afford to pay for an eye doctor. Concerned for this employee, Jiesha contemplated how she might assist him and considered donating money to help meet his optometric needs. However, the Holy Spirit led her into another direction. Jiesha had just received an email from Mel, who wanted to visit Haiti. Mel happens to be an ophthalmologist—the timing was perfect! Jiesha hoped there would be a way for Mel to incorporate her ophthalmologist training and skills with her visit to Haiti. Jiesha responded to Dr. Mel’s request and asked about a possible eye examination for Faublas. Before long, the idea grew to include other Samaritan’s Purse staff members in Haiti. With the generosity of Dr. Mel, Samaritan’s Purse worked with local pastors to also provide eye exams for 80 people from the community around L’acul. Over the span of two and a half days, 248 people, ranging from ages 8 to 90, received full eye exams. These eye exams included visual acuity checks using an eye chart and pupil dilation where Dr. Mel checked for infections, glaucoma, and other diseases of the eye. Jiesha was amazed to learn that there were many other staff members with significant eye concerns. Some had vision problems while others had eye infections and eye disease. According to World Vision Haiti, 50 percent of those affected by blindness in the Caribbean are Haitians. 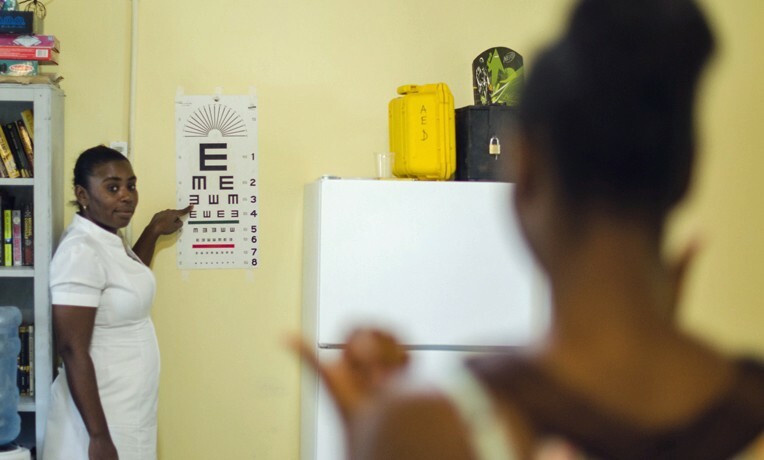 Many Haitians can spend an entire lifetime without ever having their vision checked by an ophthalmologist or optometrist. Most of their debilitating vision disorders are curable but, due to neglect, go untreated and later lead to permanent incurable problems. If not for the divine intervention of God to maintain Samaritan’s Purse in Haiti, this would have been the case for many of the beneficiaries of the free eye clinic. For more than 70 percent of the recipients, this was their first time being examined by an eye doctor. A visit to an eye clinic typically falls to the bottom of their “priority list,” taking last place to sustenance, shelter, shoes, and school. At the conclusion of her eye clinic, Dr. Mel and her assistants had passed out 152 various pairs of reading glasses/bifocals, eight pairs of frames, and three pairs of shades. Mel also applied creams and gels to treat eye infections. She wrote prescriptions, prayed, and encouraged participants to wear protective eyewear and to take better care of their eyes. Faublas is now sporting his new glasses, and he no longer has problems viewing his computer screen. Like more than 100 others wearing their glasses, he can now see clearly to perform his job better and read the Bible. I served as an assistant during Dr. Mel’s ophthalmologist clinics. It was a blessing for me to watch Mel interact with her patients. She shared Christ’s joy and love with every patient that she saw while in Haiti. I have no doubt that God used Jiesha and Mel’s initial meeting as a divine appointment to later bless the people of Haiti. God has a purpose for everything in our lives, even if we are unaware of His work at the time. When Jiesha met Mel years earlier, the two had no clue the ways Haiti would be blessed in the future. These women didn’t know how God intended to use Samaritan’s Purse as a bridge to unite them to bless people. However, now these two women can look back and see God’s orchestration in their meeting as means to bless the nation of Haiti later in their friendship.